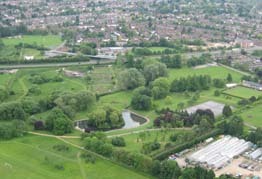 Cutteslowe and Sunnymead is the largest park in Oxford. It is located in the far north of the city. The postcodes for the park are OX2 8NP (Northern end) and OX2 7XD (Southern end). By bus: There are regular bus services to the Park, run by the Oxford Bus Company (routes 2, 2A, 2B, 2C, 2D, 7D) and Stagecoach (17, 17A and 17C). Park & Ride: The nearest Park & Ride is Water Eaton. Buses stop at the top of Harbord Road, which is a 10 minute walk to the park. By car: There are two car parks. One is at the north end of the park at the Harbord Road entrance. The other is at the south end of the Park, off the A40 entrance (heading towards Headington). Parking charges apply at both car parks. Parking restrictions apply to surrounding residential roads. The 42 hectacres that make up Cutteslowe & Sunnymead Park is split with the old Cutteslowe Park to the north and Sunnymead park to the south. The Cutteslowe area was acquired in stages, between 1936 and 1938. The Sunnymead area of the park was once a Council tip and wasteland. The two sections were joined together by a new bridge in 2002. During the Second World War large areas of the park were dug up to produce vegetables. After the war the park continued to grow with the inclusion of a disused section of allotments to the South of the Cutteslowe area of the park. This is now managed to provide a semi-natural wildlife area and community woodland. It is not a race against other runners, but a 5k timed run which can be whatever you want it to be, whether that's for fun or as part of a training plan. It offers an opportunity for all the local community, male or female, young or old, to come together on a regular basis to enjoy the Park and get physically active. Taking part is easy - just register in advance on the parkrun website by 6pm on the Friday before your first ever parkrun. The great thing is that you only ever need to do this once. After the run, if you don't have to get off straight away, there will be the chance to socialise over a cup of tea or coffee at a nearby cafe, to swap stories about your run that day. So whether you are a complete novice looking to get yourself started or a seasoned athlete wanting to use this as a part of your training schedule, you're welcome to come along and join in. Summertown Stars is a youth football club with boys and girls teams from 6-18. They are always keen to recruit new players. If you would like to join, please visit the Summertown Stars website. Wolvercote Cricket Club play their home matches at Cutteslowe Park. Visit the Wolvercote Cricket Club website for more information. The railway is owned and operated by the City of Oxford Society of Model Engineers (COSME). Visit their website for more details and train timetable. Thanks to Big Lottery Funding a special carriage 'Lottie' enables wheelchair users and their carers the opportunity to experience the thrill of the railway. Work has started on a new extension to the existing railway tracks which will link passengers to the play areas in the middle of the park. COSME aim to keep disruption to a minimum for apologies for any work being undertaken. Serving a tempting array of hot and cold drinks, snacks and treats the San Remo kiosk is the place to go to whatever the weather. You can also pay for your tennis and golf as well as picking up a copy of the park leaflet and orienteering course. As well as being home of Wolvercote Cricket Club and North Oxford Football Club, the changing facilities and multi-purpose room is available to hire. The room is suitable for classes, meetings, parties or training courses. If you would like to take a tour or book, please visit the Pitch Booking website. To find out more visit the Friends of Cutteslowe and Sunnymead website.